Colorado – on my way: make it someday. On Bruce's Trail, Steamboat, Colorado. I am a very lucky girl. My fall term is over, even though my classmates will be toiling away for another two weeks. 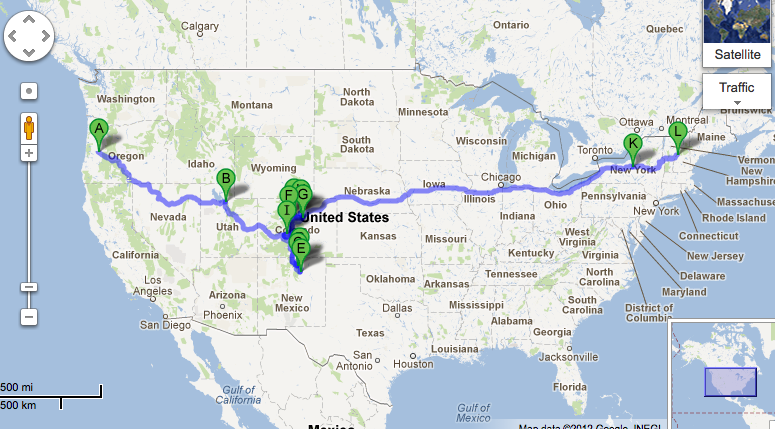 Even before school started in September, I had a vague idea that maybe I could finish school early and head west to ski. During the first week of classes, I talked to my professors, and a few weeks later bought plane tickets to Denver, Colorado. Once I had my tickets and the dream seemed to be a reality, I had to get to work to finish projects and labs. The only way I could justify having my own ski camp was to finish my schoolwork before I left, and to do a good job. Now I can look back on my last week of school and breathe a sigh of relief that it’s over. There were a few nights when I came home from the computer lab so late that all of my housemates were in bed. Hopefully those days are gone for good. There was nothing I wanted more than to be able to work in the comfort of my apartment, with a cup of tea and maybe some cookies or bread in the oven. Unfortunately, the computer software I was using for my Geographic Information Systems project doesn’t run on the Apple operating system, so my MacBook and I were out of luck. Plus, the two monitors attached to every computer in the lab made running multiple programs much easier. When I finally left the lab for the last time Thursday afternoon, I wasn’t sad. It was fun to play with maps, but the hours and hours of creating, combining, and analyzing datasets made it much less so. I gave a “final” presentation on my last day, the same day when my classmates were presenting their progress reports. I wish the presentation had gone a little better, but I had finished working with my data the night before and didn’t have much time to come up with conclusions. This is not out of the ordinary for many college students, but I usually finish my work with plenty of time to spare. After class, I said goodbye to my professor and promised him I’d e-mail in my final paper as soon as I could, It was surreal to realize that there was nothing left to say; I was free! Now I am just thrilled to be skiing and I don’t mind that my free time is spent writing papers and working on my thesis. There’s no snow here in Granby, but it’s only an hour and fifteen minutes to Rabbit Ears Pass, where the Steamboat Springs Nordic Council grooms 5 kilometers of trails. There’s great snow cover and I haven’t seen a single rock. I’ve skied close to two hours each of the last two days. There are three loops, and I ski them over and over again. I see every other person there several times, and I’m getting very familiar with the ups and downs and corners. My aunt, who is hosting me, is somewhat incredulous that I keep wanting to ski the same loops every day instead of going biking with her. I don’t mind the repetition, though. This is one of only a handful of places in the country with skiing, and the snow is fabulous. But despite my bliss, I’m a little bit lonely out on the trails. I’ve been thinking about the last few workouts I did before I left, and missing having teammates to train with. Wednesday afternoon was the last running “OD”. No, we don’t do drugs; it stands for “over-distance”, our longest workouts. We parked our bus at the Marion Cross School and set off into Norwich. Just like any other workout, we kept plugging along and eventually made it to the top of the hill with its huge houses and beautiful views. The wind howled and Ruth McGovern ran with her hands over her ears because she hadn’t worn a hat. We used the architecture, fences, and paint-color choices as a lesson in what is or is not old-style New England. We looped up Brigham Hill Road and down Tilden Hill Road, but the run was still the shortest one we’d done all season. We didn’t mind; it was cold and we were all stressed and sick of dryland. We climbed back into the bus for the short drive back to campus, chatting about classes, plans, and gossip. Just like everything, my solo training camp is a tradeoff. I’d rather be skiing here than rollerskiing in the below-freezing weather in Hanover. And the fact that I’m done with school is totally worth the miserable week I put in earlier. To me, it’s worth missing my teammates for a few weeks, especially since I get to visit with my favorite aunt. But when I return for a team camp in Quebec in mid-December, having my team around me will truly feel like coming home.